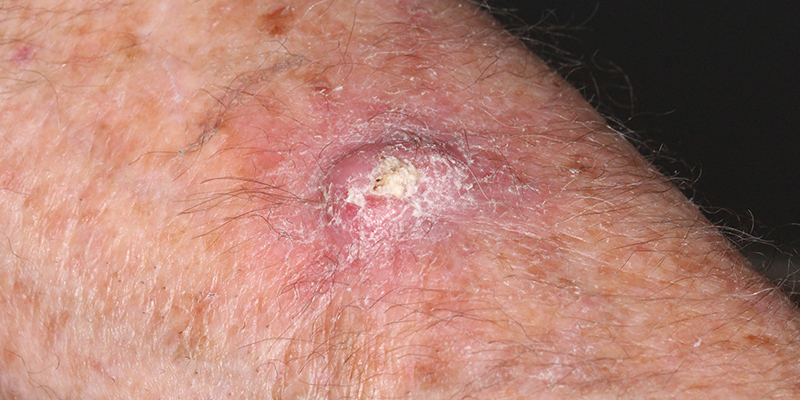 Keratoacanthoma has been described as a benign lesion that spontaneously involutes and as a variant of squamous cell carcinoma that rarely can behave aggressively. We present a case of a keratoacanthoma-like lesion in an elderly patient that recurs invading deeply into vital structures. (3) an involution phase of up to one year duration. KA has distinct histological features of keratin-filled crater lined by a proliferating squamous epithelium. Shave or incisional punch biopsies are usually inadequate to diagnose keratoacanthoma, and the definite diagnosis can only be established after tumor excision, based on the histological findings. Treatment of classic keratoacanthomas can be conservative given their self-limiting course and has included curettage and intralesional methotrexate. The catch with KA is the association with squamous cell carcinoma (SCC) and occasional aggressive behavior. 16.7% of KA are SCC. This speaks to the significant overlap in the clinical and histological appearance of the two, which can result in misdiagnosis of SCC as KA. In addition, KA may coexist with a SCC in the same lesion, as the more aggressive cell line eventually transforms the tumor into an aggressive lesion. The development of SCC in a KA has been reported in 5.7% of KA’s. In patients older than 90 years, the transformation incidence was found to be almost 14%. Metastases with KA’s are very rare even with evidence of perineural invasion. It has been suggested that perineural invasion in KA’s is less significant than in SCC. Treatment of keratoacanthomas is surgery. Mohs surgery is the standard with a reported recurrence rate of 2.4%. Radiation including orthovoltage has been shown to be highly effective as well. Donohue, et al. Treatment of aggressive keratoacanthomas by radiotherapy. J Am Acad Dermatol 1990; 23:3: 489-493. Larson. Keratoacanthomas treated with Mohs’ micrographic surgery. J Am Acad Dermatol 1987; 16:5: 1040-1044. Caccialanza, et al. Radiation therapy of keratoacanthomas: results in 55 patients. Int J of Radiat Oncol Biol Phys 1989; 16:2: 475-477. Mandrell, et al. Keratoacanthoma: hyperplasia, benign neoplasm, or a type of squamous cell carcinoma? Semin in Diagnost Pathol 2009; 26:3: 150-163. Donaldson, et al. Periocular keratoacanthoma. Ophthalmology 2003; 110:7: 1403-1407.